Our Girmitiyas will always be valued for their hard work to make our lives better, says Aiyaz Sayed-Khaiyum. The Attorney-General and Minister for Economy made the remarks at Albert Park in Suva yesterday during the launch of the centennial celebrations of the last shipload of Indian indentured labourers to Fiji. He announced that on November 9, Fiji would be commemorating the event. The last of the Girmitiyas arrived from British India on November 11, 1916 on board the ship, Sutlej V.
Other municipalities will be celebrating the event on November 10 and 11. Mr Sayed-Khaiyum said people were whipped, women and men were exploited during their indentured labourer contract term of five years. “A lot of the indentured labourers used to run away and seek refuge in many of the koros (villages). “The British then had passed an ordinance that made it illegal for a villager to give refuge to a run-away indentured labourer. “There are many information and stories such as these that many of us did not know as part of our history,” Mr Sayed-Khaiyum said. He said this event gave everyone an opportunity to be able to look at many of those stories unknown to us. “I think it is very encouraging to talk about the courage and indeed the ultimate price of these people who had been very much suppressed through a particular system and were able to then survive it and then be able to become free citizens of Fiji. “In 1979, we had celebrated the 100 years of the first arrival of indentured labourers who came in the ship called Leonidas in 1879. “Since then, we have not had any significant national celebrations so this is the next celebration that the Government is putting in place which will be celebrated throughout Fiji. It will mark the 888 indentured labourers that came on Sutlej V who were treated like products. “They were numbered who came to work in the sugarcane and other fields. “I think this will give us ability to create awareness as to what had happened with our ancestors. “Indentured labour system was a nice way of saying slavery. “There were over 60,000 indentured labourers from British India that were brought to Fiji and of course, many … remained in Fiji after the indentured period,” Mr Sayed-Khaiyum said. 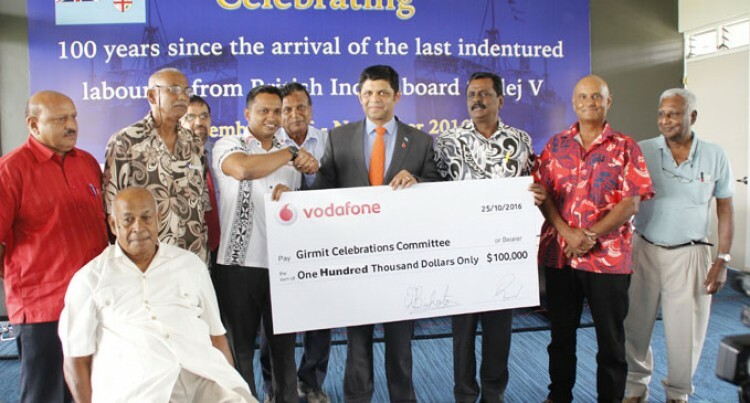 A donation of $100,000 was presented by Vodafone Fiji to the Girmit Council for the celebrations. Vodafone Fiji chief marketing officer Rajnesh Prasad said the amount would be distributed to the municipalities for the celebrations.